In addition to maintaining and improving New York’s extensive transportation infrastructure, the Department of Transportation (DOT) promotes access to quality open space, through initiatives like the NYC Plaza Program and Summer Streets. DOT also encourages New York City residents and visitors to explore the city’s parks and natural areas. Located along the Hudson River between 100th and 129th Streets, Cherry Walk in Riverside Park has an unusual history. Most people are familiar with Riverside Park, one of only eight scenic landmarks in New York City, but this section of land was originally occupied by railroad tracks and dumps. State legislation expanded Riverside Park to encompass the area in 1894, and in 1930, this part of Riverside Park was created by filling in the river to construct the West Side Highway. In 1909 New York celebrated the 100th anniversary of Robert Fulton’s steam power demonstration on the Hudson and the 300th anniversary of Henry Hudson’s discovery of the river bearing his name. A naval parade from New York City to Newburgh, N.Y., began from this part of the river. 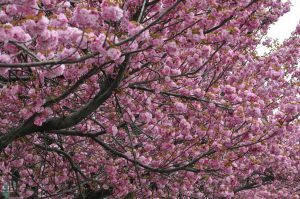 The Committee of Japanese Residents of New York gifted 2,000 cherry trees to the city as part of this 18-day celebration, and the original planting of 700 trees—part of the same batch gracing the Tidal Basin in Washington, D.C.—inspired the name Cherry Walk. Completed in 1937, the West Side Improvement plan created scenic roads for automobile drivers, as well as recreational facilities along the new expanse of land between the now-covered railroad tracks and roadway. As a child growing up in the area, I was warned against using that part of the park because of “ne’er do wells” that congregated there. It does my New York heart proud to see Cherry Walk revitalized as part of the Hudson River Valley Greenway, a project that was completed in 2001. Today Cherry Walk is part of a designated “greenway,” where only bicyclists and pedestrians are allowed.